ONE OF THE leaders of the former Khmer Rouge regime will be set free after a court in Cambodia ruled Thursday that she was medically unfit to stand trial for genocide, a decision survivors called shocking and unjust. Cambodia’s UN-backed tribunal issued a statement saying that 80-year-old Ieng Thirith suffers from a progressive, degenerative illness that is likely Alzheimer’s disease and diminishes her mental capacity. Ieng Thirith was the Khmer Rouge’s minister for social affairs and the regime’s most senior-ranking woman. She was also the sister-in-law of late Khmer Rouge leader Pol Pot. She is accused of involvement in the “planning, direction, coordination and ordering of widespread purges” and was charged with crimes against humanity, genocide, homicide, torture and religious persecution. Ieng Thirith has said the charges against her are “100 per cent false” and said she always worked for the benefit of the people. The UN-backed tribunal is seeking justice for an estimated 1.7 million people who died of starvation, exhaustion, lack of medical care or execution during the communist Khmer Rouge’s 1975-79 rule. The tribunal is currently trying three other senior leaders, including Ieng Thirith’s husband, 86-year-old Ieng Sary, who was the regime’s former foreign minister. Also on trial are 85-year-old Nuon Chea, the Khmer Rouge’s chief ideologist and the No. 2 leader behind the late Pol Pot, and 80-year-old Khieu Samphan, an ex-head of state. The tribunal’s statement stressed that Ieng Thirith’s release does not mean the charges against her are being withdrawn and it was not a finding of guilt or innocence. But that offered little consolation to survivors of the Khmer Rouge era, including 71-year-old Bou Meng, whose wife and two children were executed at the notorious S-21 prison in Phnom Penh. Email “Cambodia genocide defendant ruled unfit for trial ”. 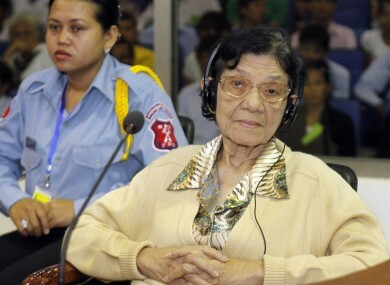 Feedback on “Cambodia genocide defendant ruled unfit for trial ”.